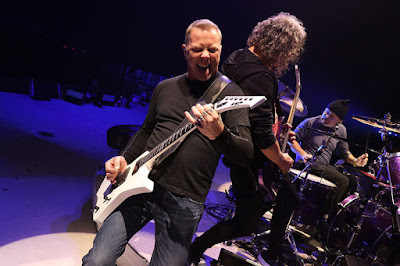 Metallica performed their 1991 classic, “Sad But True”, at the at Altice Arena in Lisbon, Portugal on February 1, and the band are sharing professional footage from the event. The track was the fifth single of the group’s self-titled record, commonly known as the “Black” album, the band’s first to top the US charts on its way to sales of 16 million in the States and more than 30 million worldwide. The band’s tenth studio effort recently earned Metallica the No. 1 spot on Billboard’s 2017 Top Rock Albums and Hard Rock Albums rankings, with the group being named the No. 1 Rock Artist of 2017 by Nielsen Music as part of the global measurement and data analytics company’s year-end music report – ahead of Imagine Dragons, The Beatles, Linkin Park and Twenty One Pilots, among others. On April 13, Metallica will reissue their 1987 collection, "The $5.98 EP – Garage Days Re-Revisited." Out-of-print and available for the first time in decades, the 5-track set sees the band deliver covers of some of their influences, including Diamond Head, Misfits and Budgie.